Stainless Steel clips holds HatEyes securely to cap or hat. This #5 lenses = 2.25x power with an approximate working distance from lens 10 inches. enough angle at the pivot to allwo the index finger to enter the "v" and bring the lens down for use. 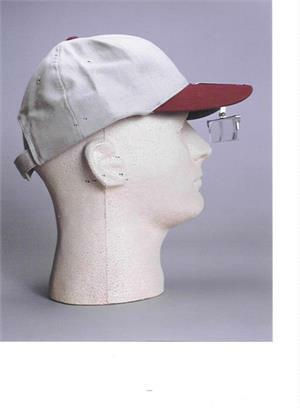 Storing the lens flat under the brim may result in the lens then contacting the forehead. Storage may also be using the Clear Clamshell Packaging you received your HatEyes. face or shirt due to the magnification from the Sun. All USA MADE since 2001!